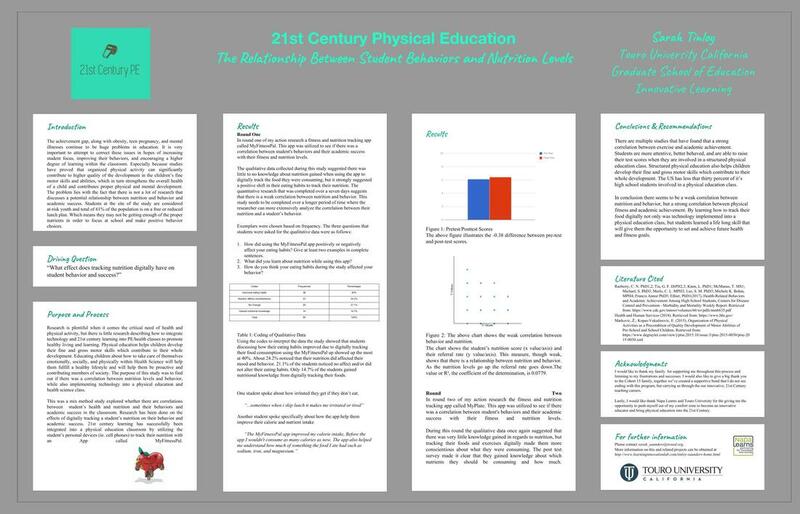 My driving question has been all over the place throughout this program, but what it has really boiled down to is "how do we bring physical education into the 21st Century?" Educating young people in Health Science and Physical Education will give them the opportunity and ability to fulfill a healthy and active lifestyle. This means they need to be taught how to take care of themselves emotionally, socially, and physically, so that they can become productive and contributing members of society. Multiple studies confirm the relationship between physical activity and academic achievement. Studies also indicate a need for technology in a physical education classroom, but finding ways to bring Health Science and Physical Education into the 21st century by utilizing technology in both settings has proven to be difficult, especially due to a lack of resources. The purpose of this study was to research the effects of digitally tracking a student’s nutrition on their behavior and academic success. 21st century learning was successfully been integrated into a physical education classroom by utilizing the student’s personal devices (ie. cell phones) to track their nutrition. In round one of my action research a fitness and nutrition tracking app called MyFitnessPal (more about this app on the assessments & lessons pages) was utilized to see if there was a correlation between student's behaviors and their academic success with their fitness and nutrition levels. ​The qualitative data collected during this study suggested there was little to no knowledge about nutrition gained when using the app to digitally track the food they were consuming, but it strongly suggested a positive shift in their eating habits to track their nutrition. The quantitative research that was completed over a seven days suggests that there is a weak correlation between nutrition and behavior. This study needs to be completed over a longer period of time where the researcher can more extensively analyze the correlation between their nutrition and a student’s behavior. In round two of my action research the fitness and nutrition tracking app called MyPlate (more about this app on the assessments & lessons pages) was utilized to see if there was a correlation between student's behaviors and their academic success with their fitness and nutrition levels. During this round the qualitative data once again suggested that there was very little knowledge gained in regards to nutrition, but tracking their foods and exercises digitally made them more conscientious about what they were consuming. The post test survey made it clear that they gained knowledge about which nutrients they should be consuming and how much. In conclusion there seems to be a weak correlation between nutrition and behavior, but a strong correlation between physical fitness and academic achievement. By learning how to track their food digitally not only was technology implemented into a physical education class, but students learned a life long skill that will give them the opportunity to set and achieve future health and fitness goals.